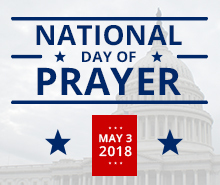 Today has been designated the National Day of Prayer. Many Americans will spend extra time today praying to God, asking the Lord to bless many people in various ways. Noting that Jesus thought that prayer was vitally important, his disciples asked him to teach them to pray (Luke 11:1). He proceeded to teach them the model prayer that has since been used by his followers all over the world. The early Christians were devoted to prayer (Acts 2:42). Wonderful and amazing things happen when God’s people pray in the authority of Jesus Christ (Acts 4:31). Let’s take some extra time to pray today. Surely you would agree that we all could benefit from that! This entry was posted in Christian Living, Communion Meditations, Current Events, Prayer and tagged Acts 2:42, devoted to prayer, illustration, Lord's Prayer, model prayer, National Day of Prayer. Bookmark the permalink.